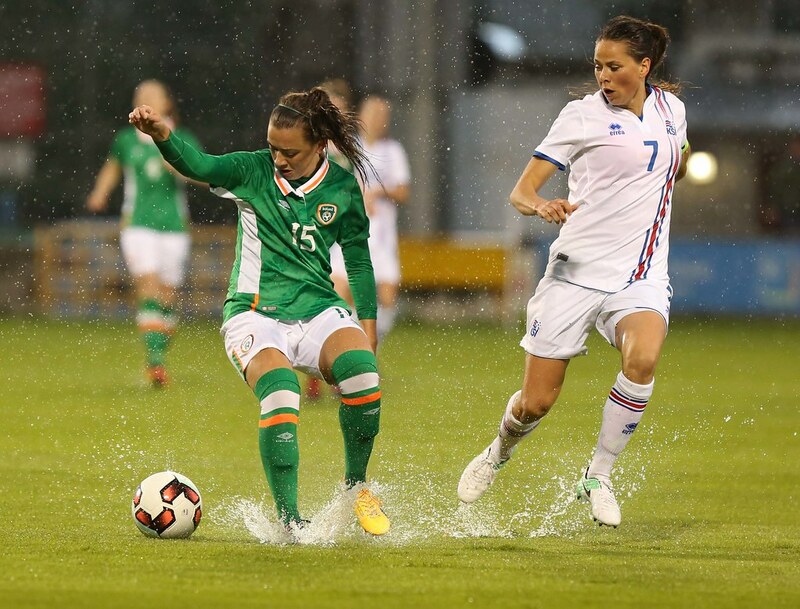 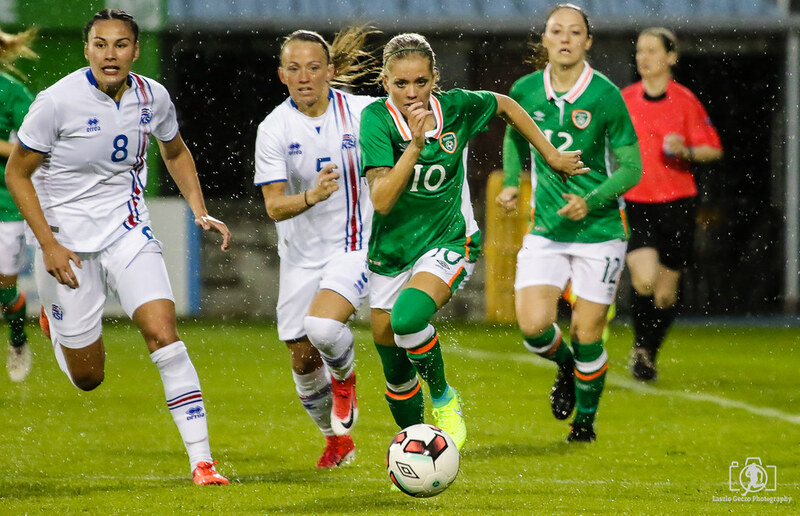 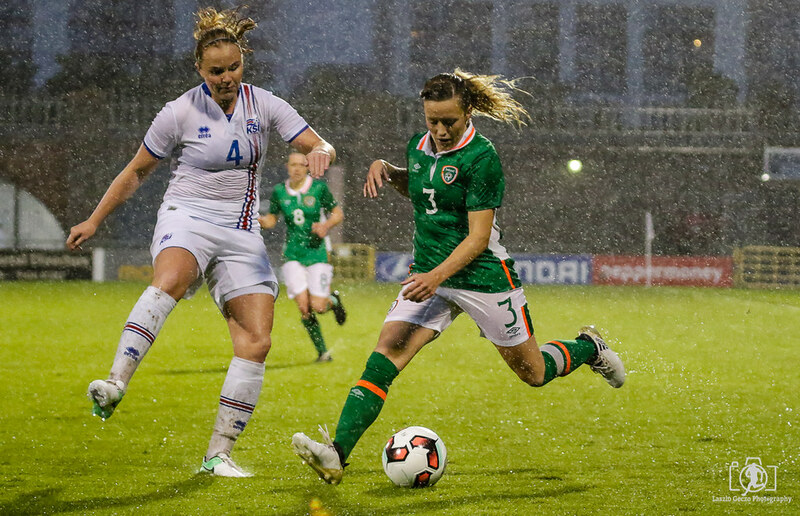 Since Colin Bell took over as manager, there has been a real sense of positivity amongst Irish women’s soccer with the Girls in Green being in impressive form ever since. 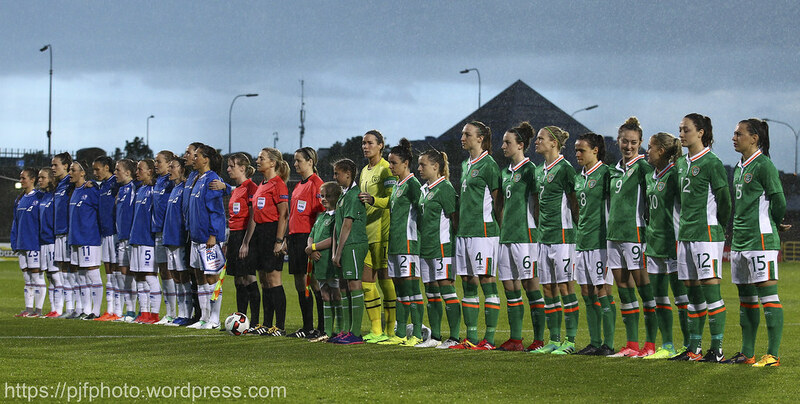 An Englishman in the form of Jack Charlton took Ireland’s men’s team to the World Cup for the first time in 1990 and given the displays under Bell to date, there is no reason why another English man cannot take the Women’s team to the finals in France in two years’ time. 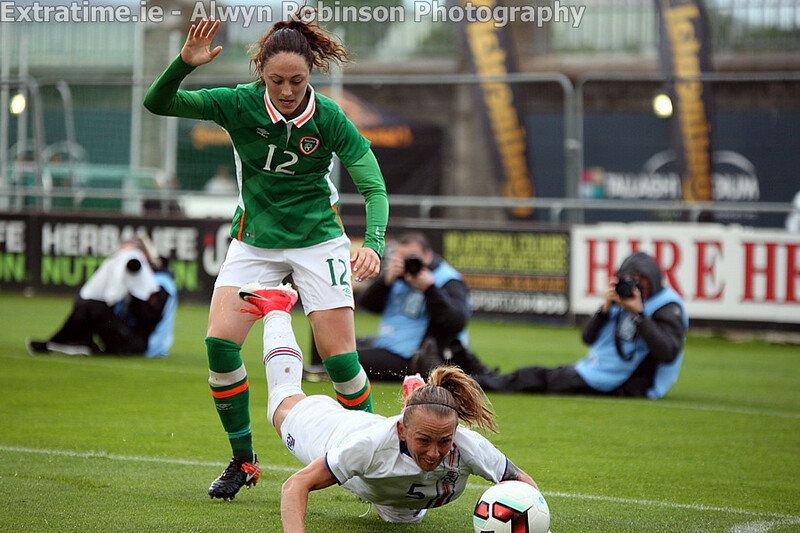 Bell has an impressive CV that’s for sure. 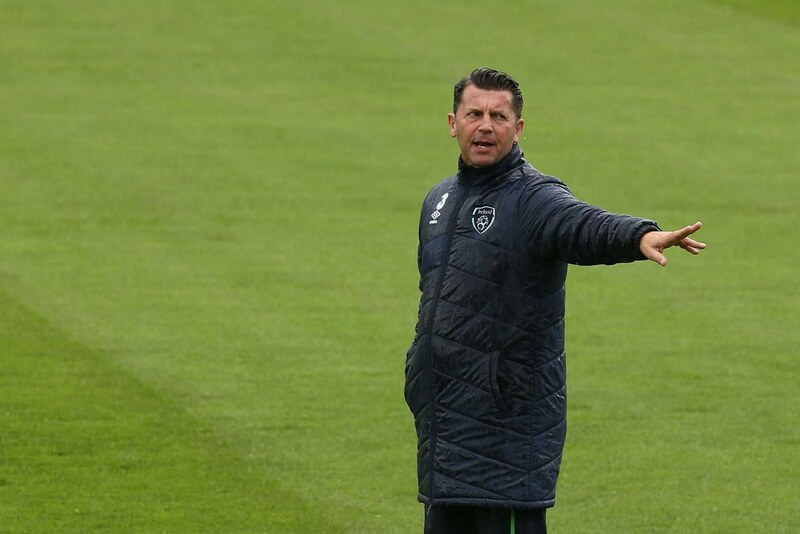 He was at Mainz as a coach during the period when Jurgan Klopp was in charge of the German club. 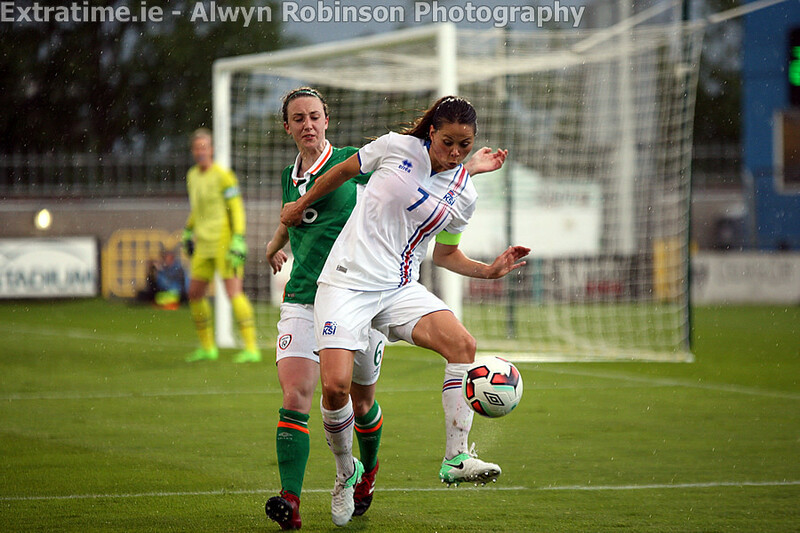 Bell won the UEFA Women’s Champions League during his time with Frankfurt in 2015. 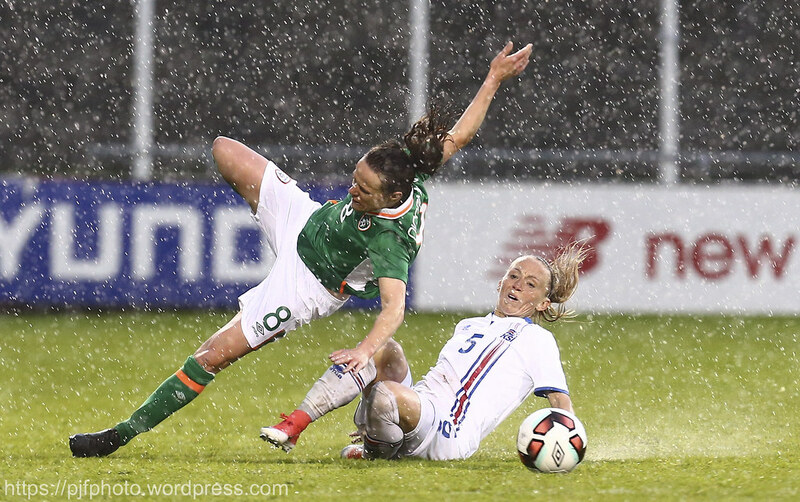 His appointment shows the ambitions the FAI have for Women’s soccer and he seems to have delivered thus far. 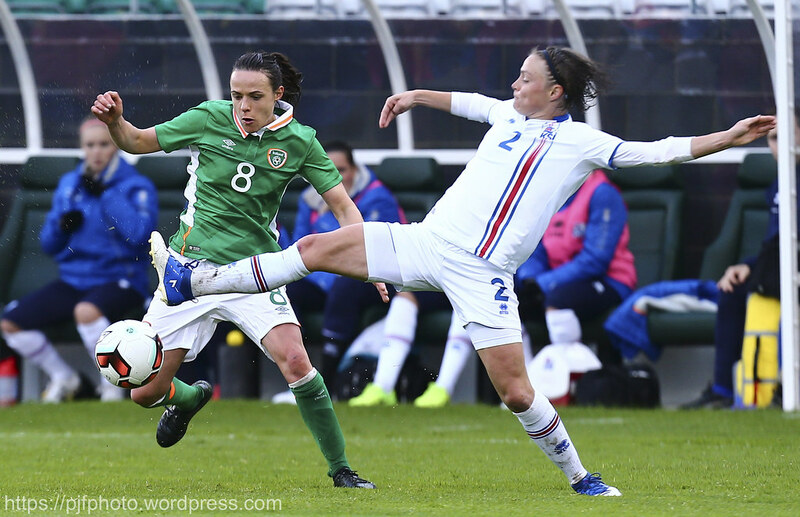 Megan Campbell of Manchester City was included in the starting line-up, fresh off the back of winning the Women’s FA Cup Final at Wembley. 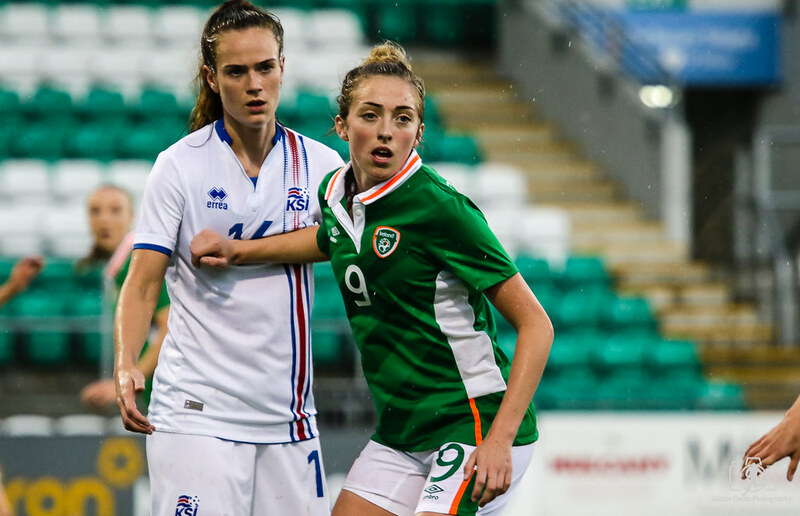 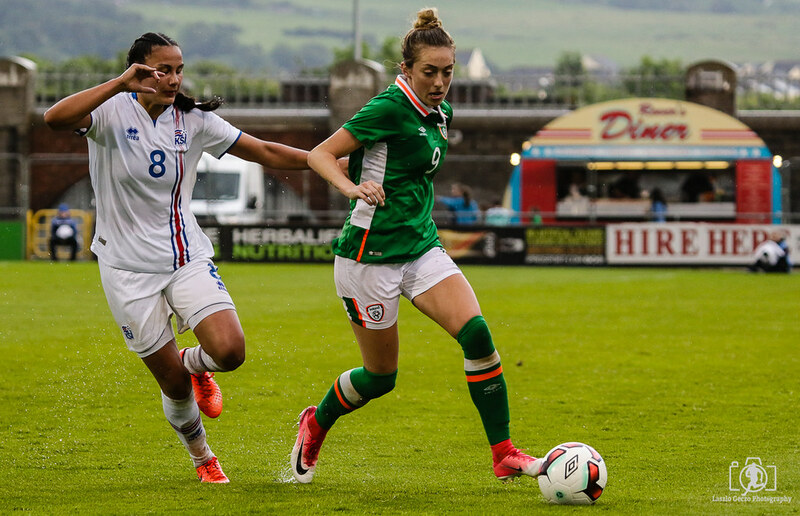 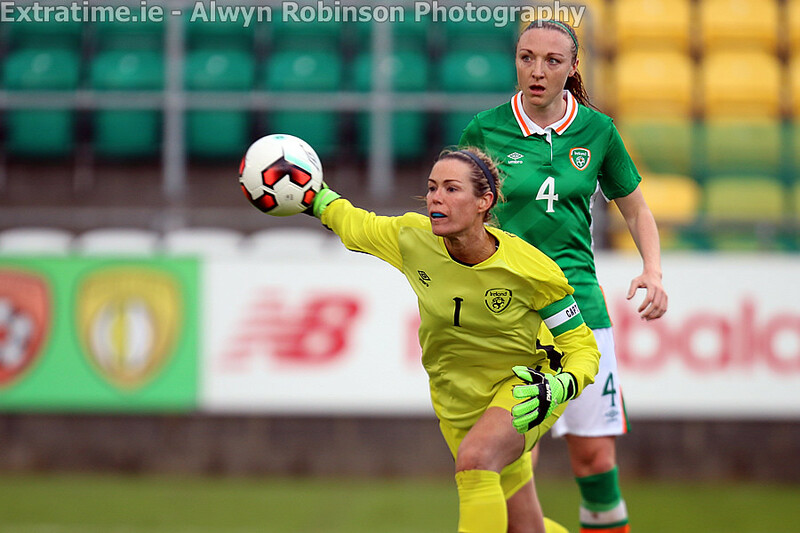 Campbell made her first appearance for Ireland in fifteen months and she is one of the Irish players who one thinks will have a crucial role if Ireland can achieve World Cup qualification. 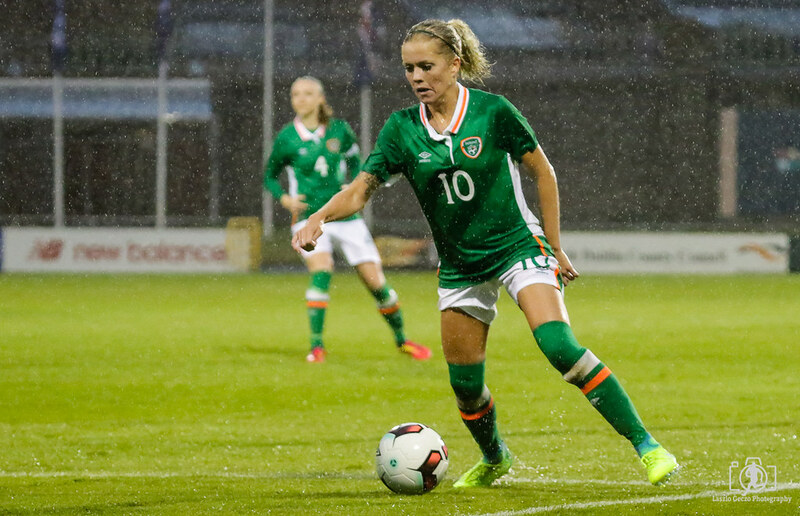 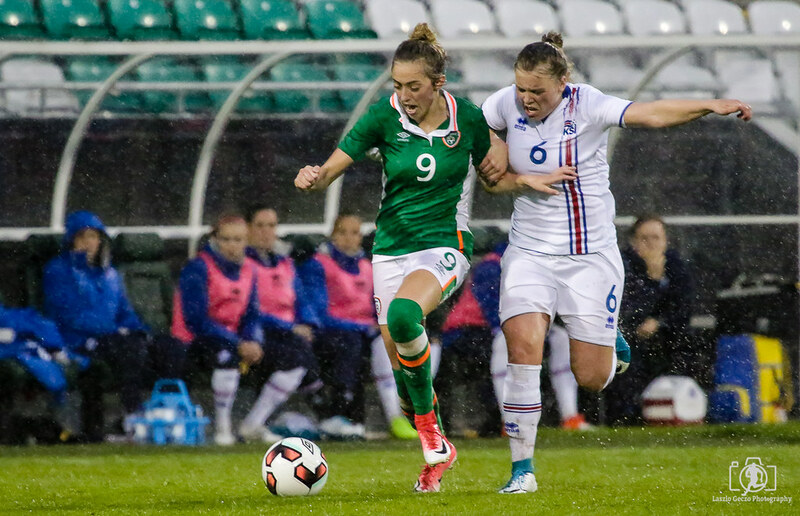 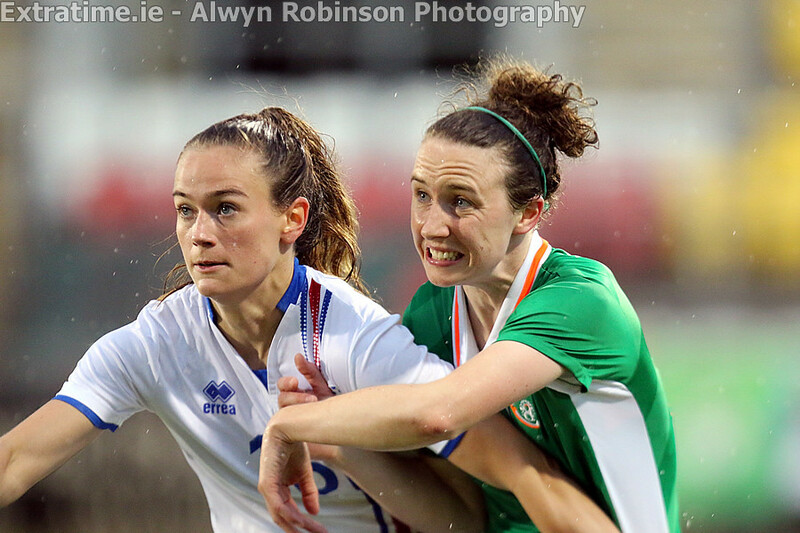 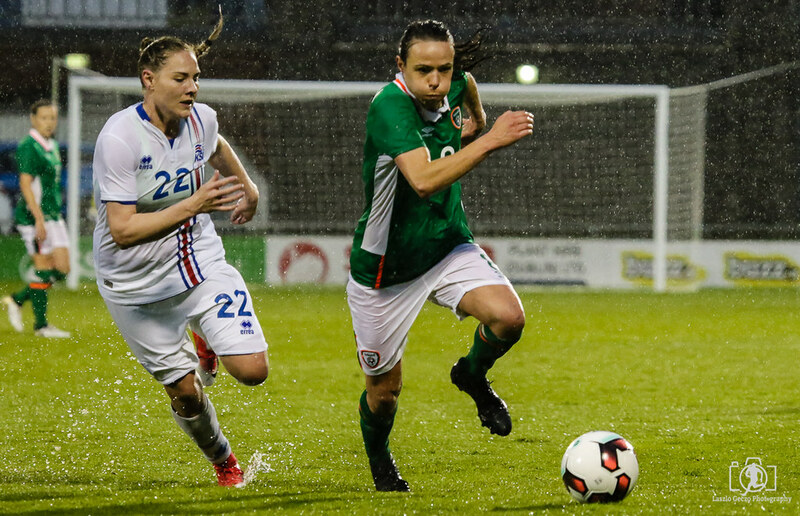 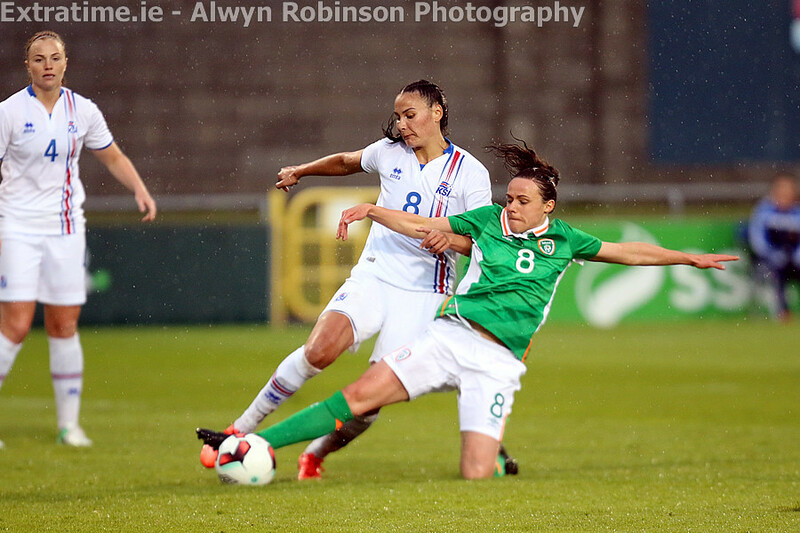 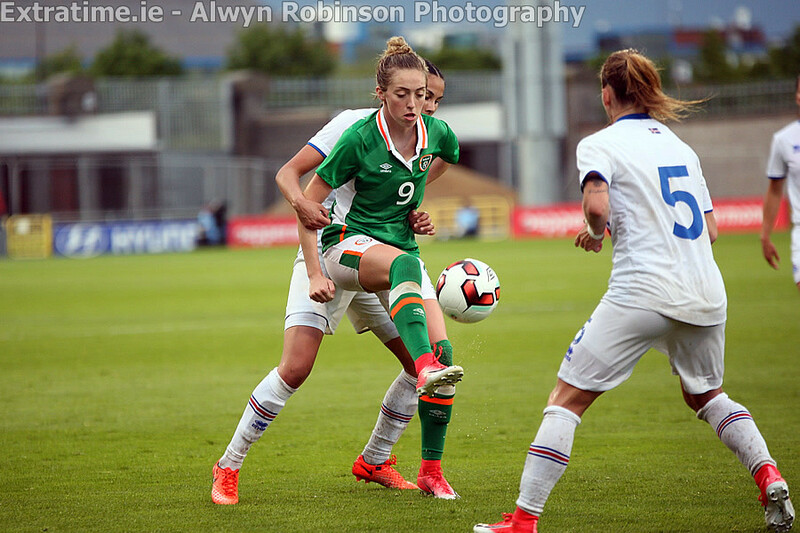 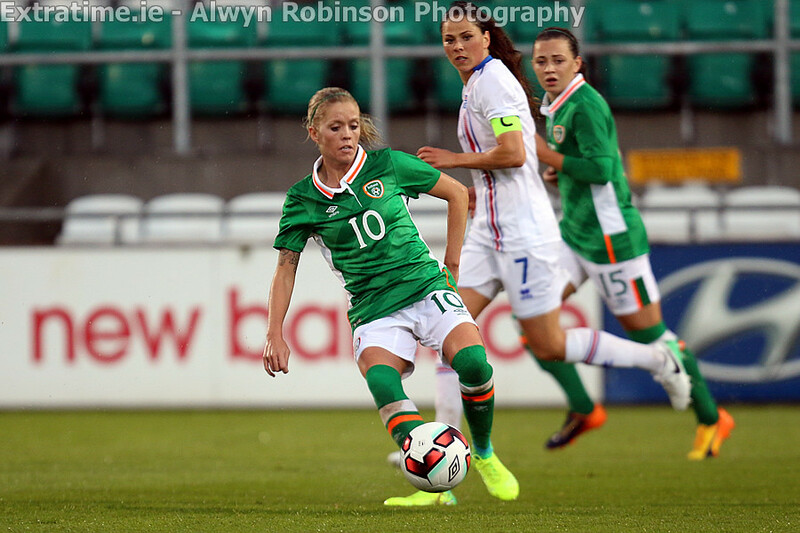 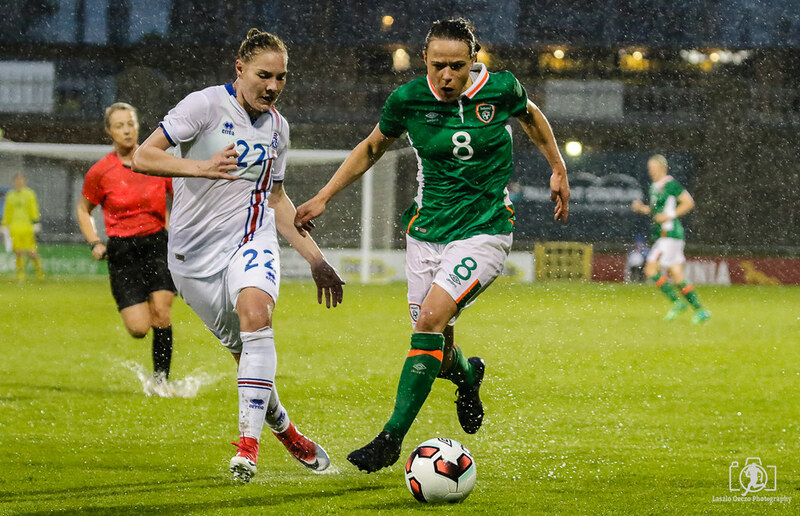 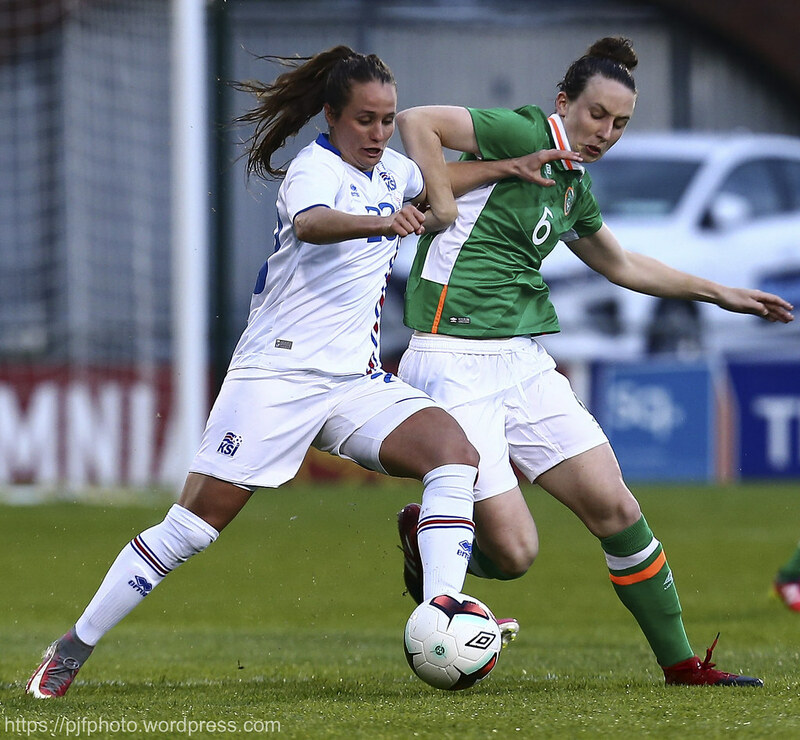 She was one of Ireland’s best performers on the night against Iceland, looking to get on the ball regularly and using it usefully in possession. 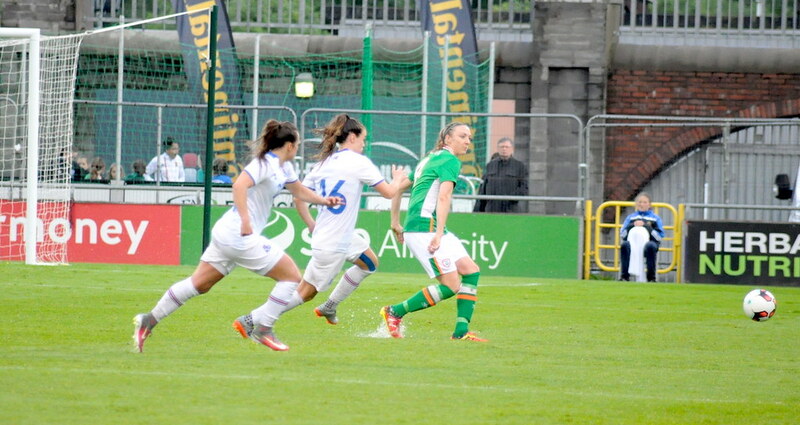 Both sides began this one brightly and full of intent. 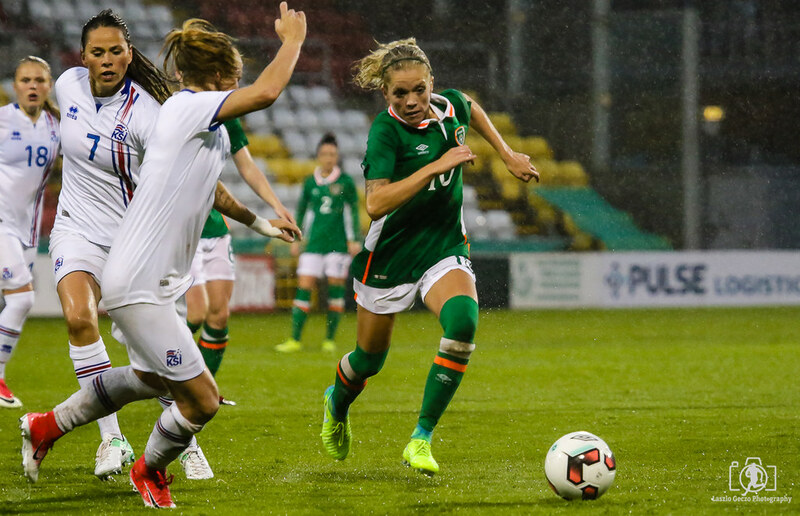 Campbell showed her innovation after just 11 minutes, when she picked out Megan Connolly inside the box, but the latter was unable to position herself to direct her headed effort on target. 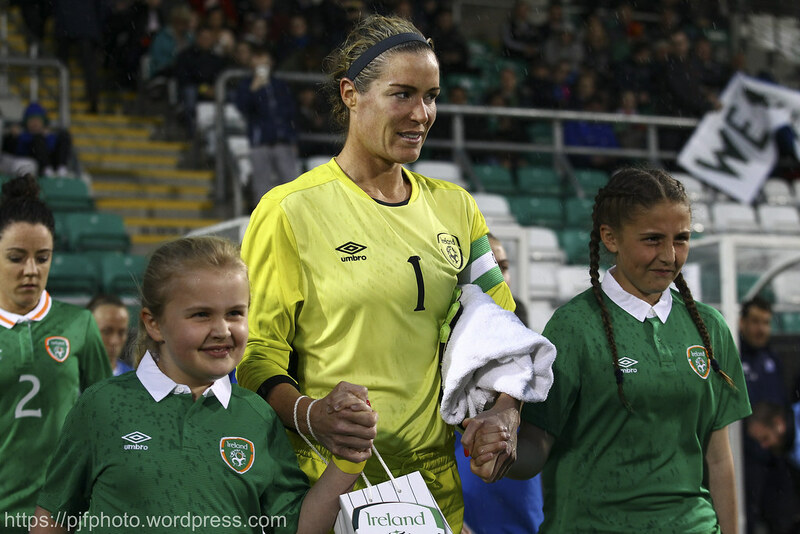 There were signs from the opening stages of the positive mentality in the Irish set up currently, as they were on the front foot. 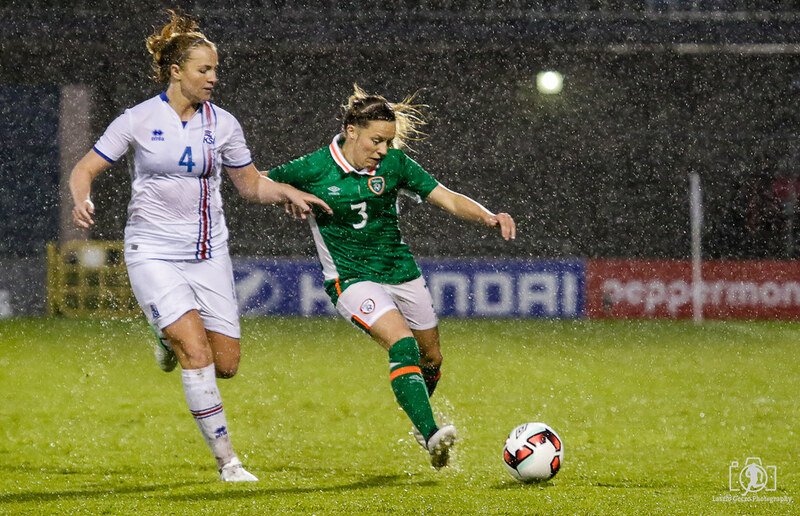 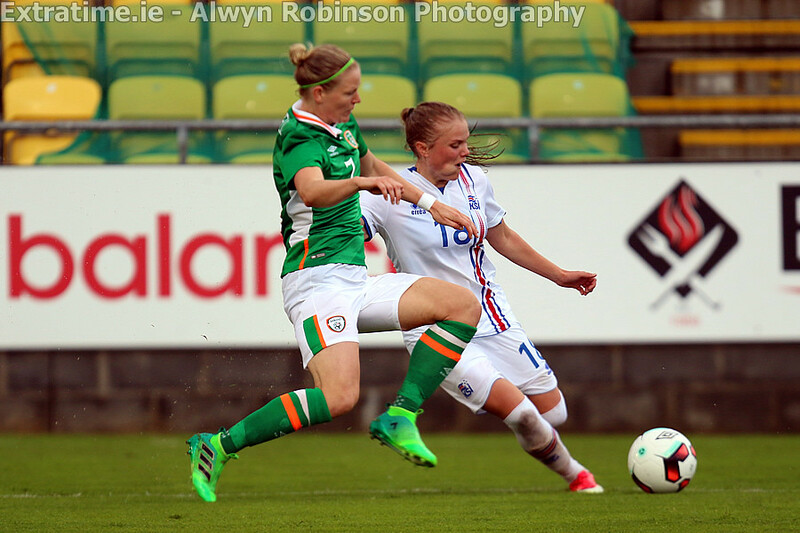 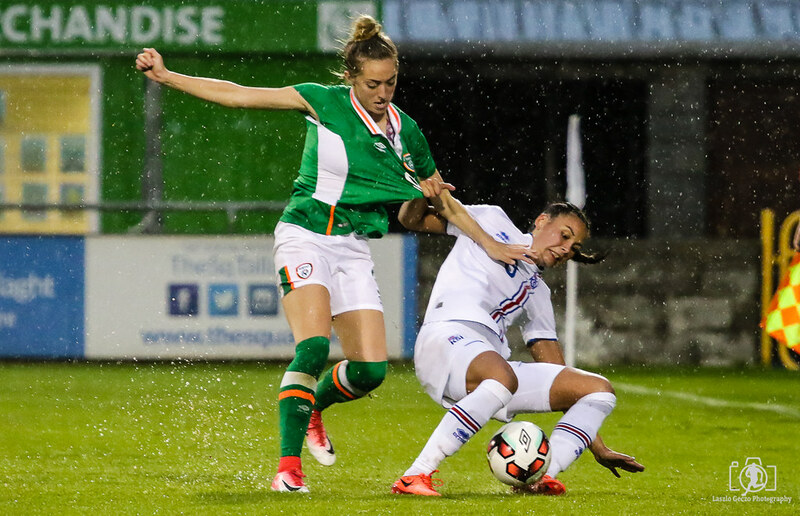 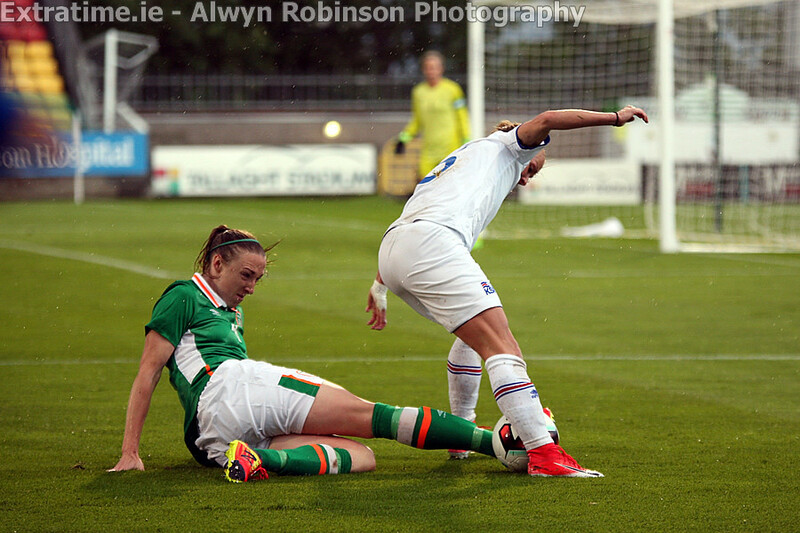 It was Campbell who would go the closest for Ireland in the opening half, but her headed effort was saved by Gunnarsdottir in the Icelandic goal. 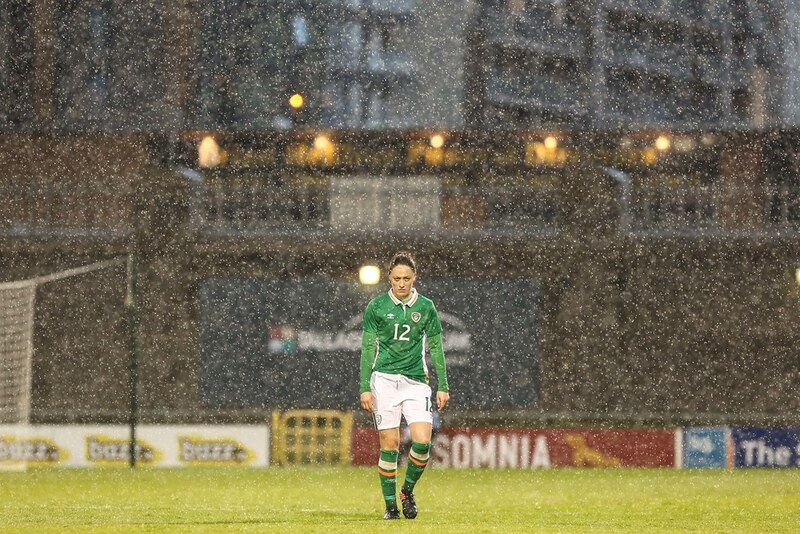 Denise O’Sullivan also was looking a threat with her pace, while Megan Connolly also threatened down the wing, getting away from her marker and crossing well, but there unfortunately was no one on hand to direct the ball on target. 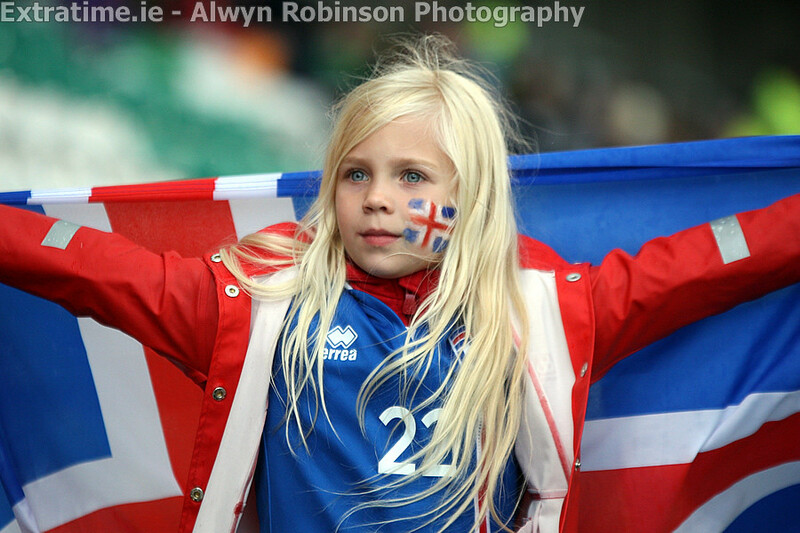 Iceland will be at July’s European Championships and they are also currently ranked 18th in the world rankings. 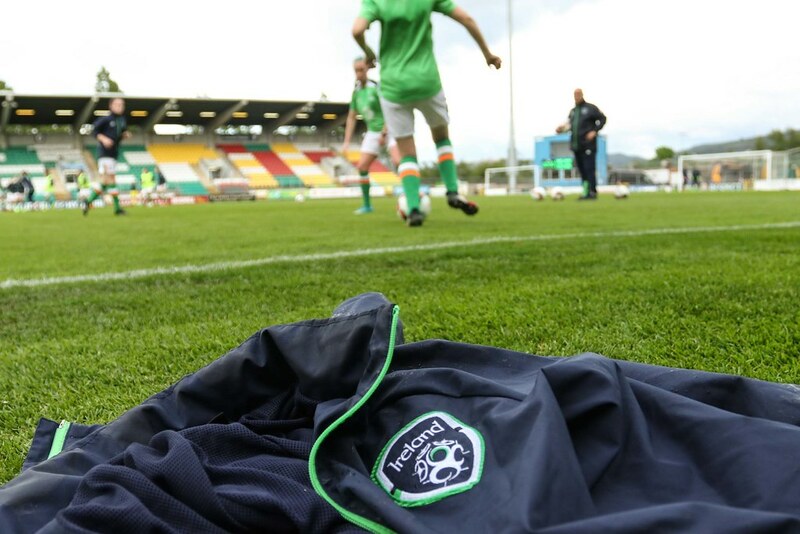 Given they are a country similar in size to the Republic Of Ireland, you can see why Bell is ambitious about the national team and that a country like Ireland can qualify regularly for major tournaments. 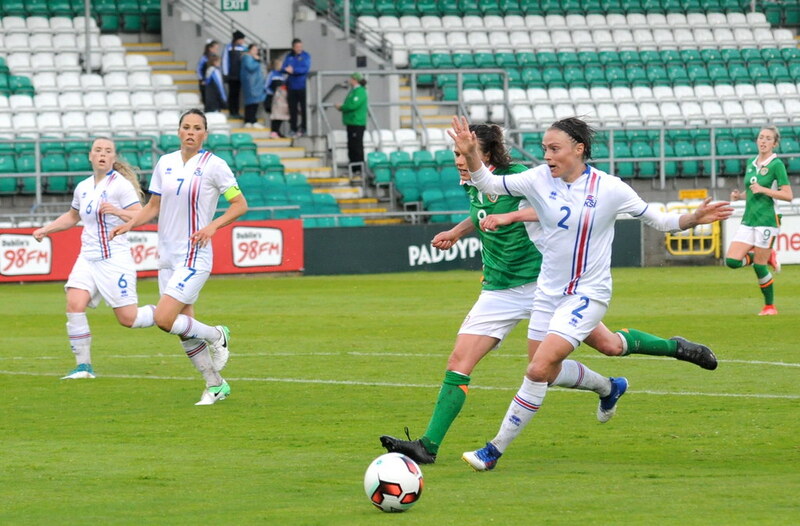 Iceland has the same population as Cork just to put things into context, they looked technically good on the ball, but for large spells they failed to create a clear cut chance on goal. 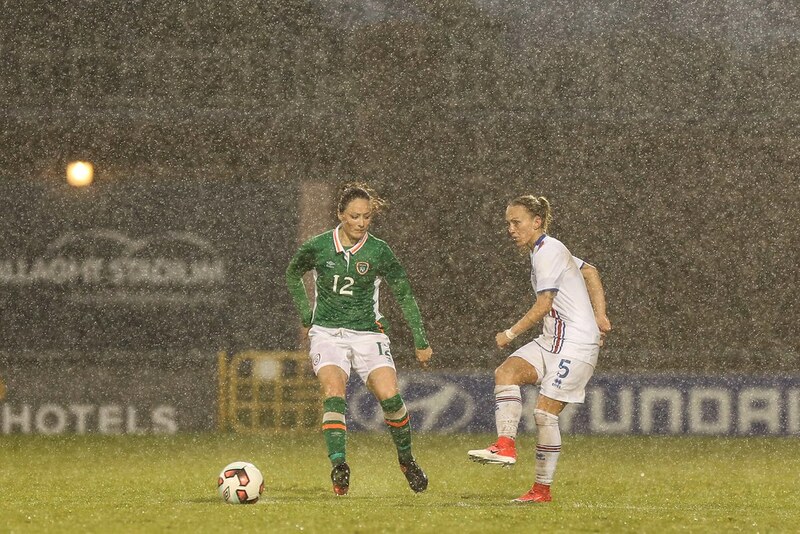 As the heavens opened once again in the second half, it made the conditions very difficult to get the ball down on the deck and to play, resulting in goal chances being at a premium. 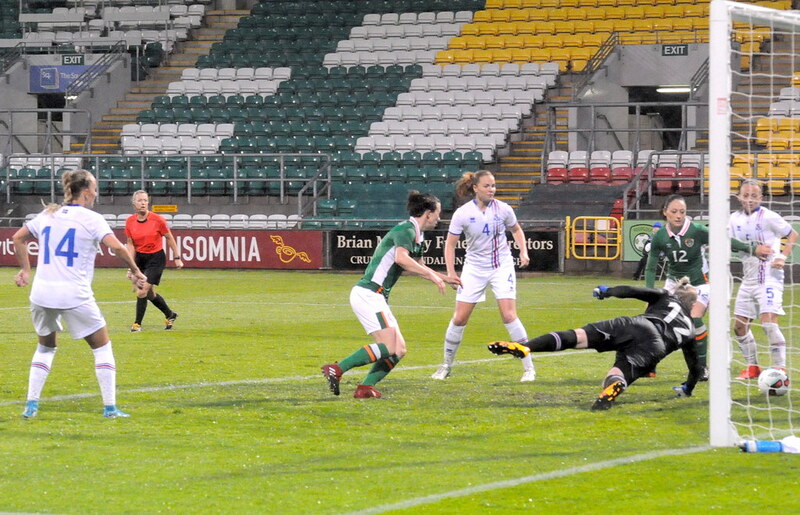 The visitors went very close to opening the scoring on the hour mark, but from inside the box, Asbjornsdottir was denied by a great save from Marie Hourihan in the Irish goal, with the Manchester City based girl coming on at the start of the second half. 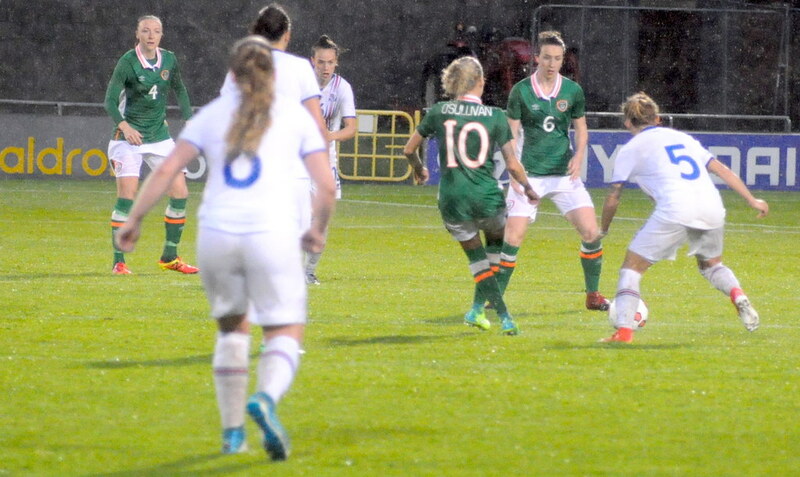 Ireland would go very close from a well delivered corner, but neither Diane Caldwell nor Aine O’Gorman could steer the ball on target. 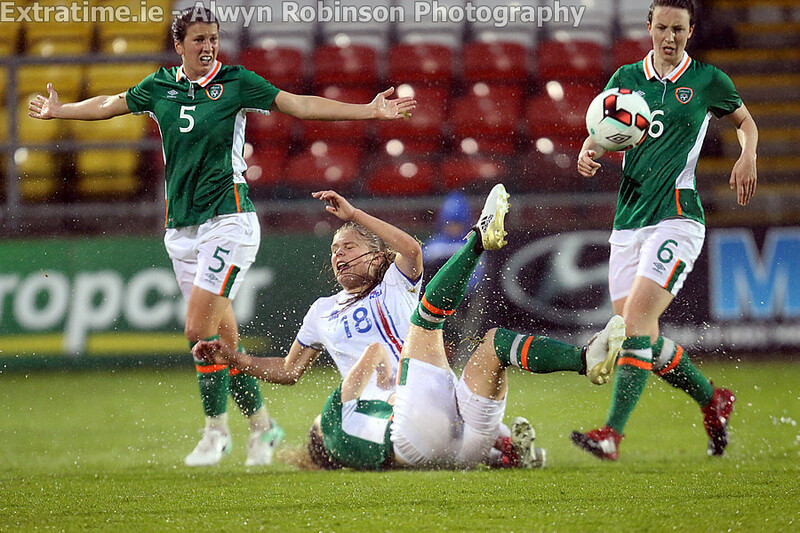 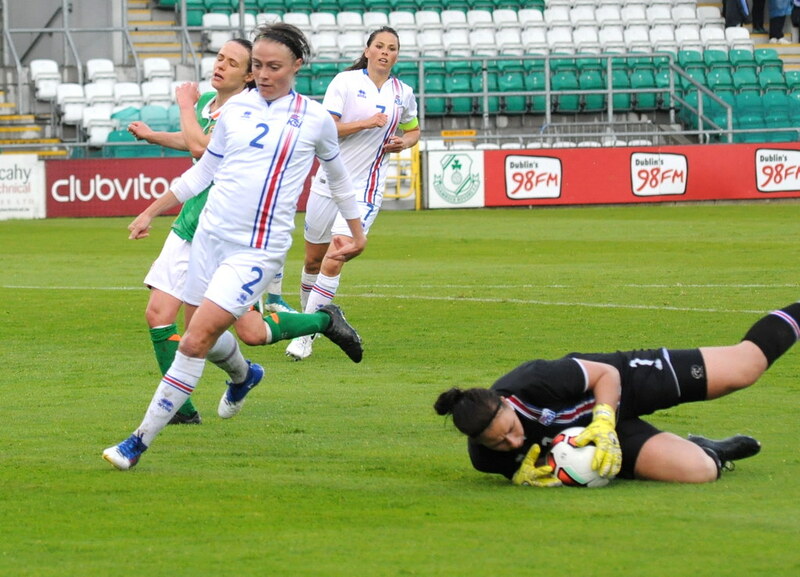 O’Gorman would go close late on for the hosts, with her effort stinging the hands of the Icelandic netminder. 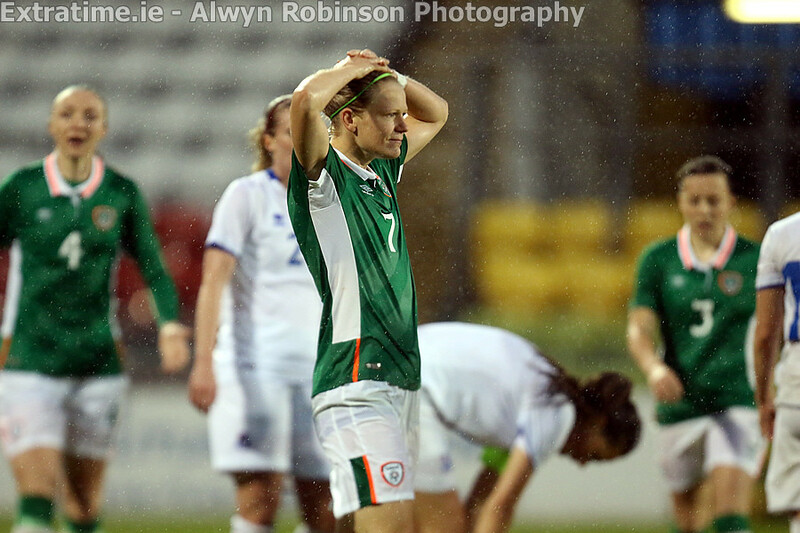 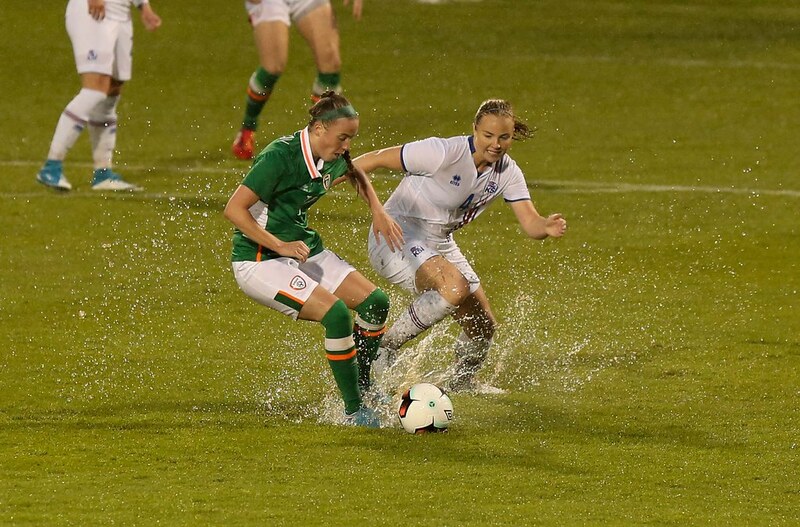 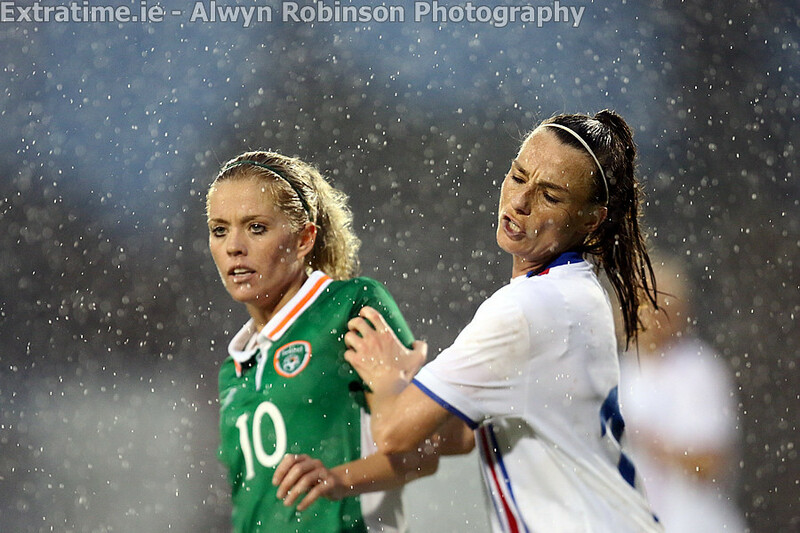 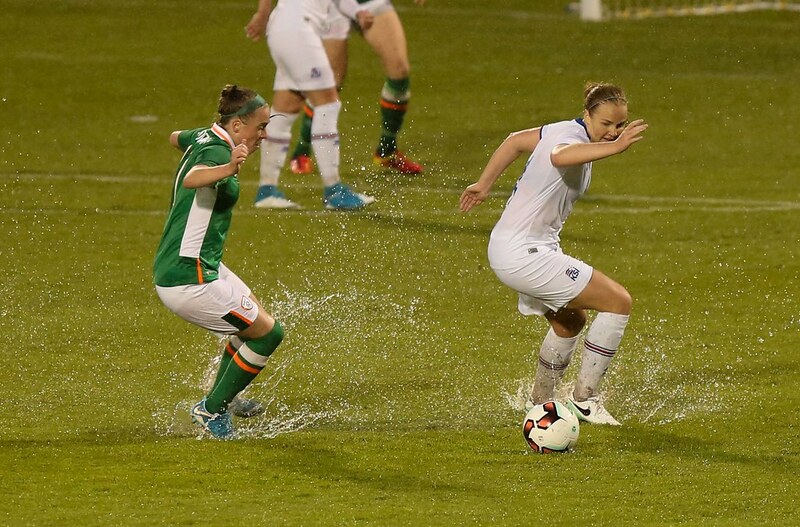 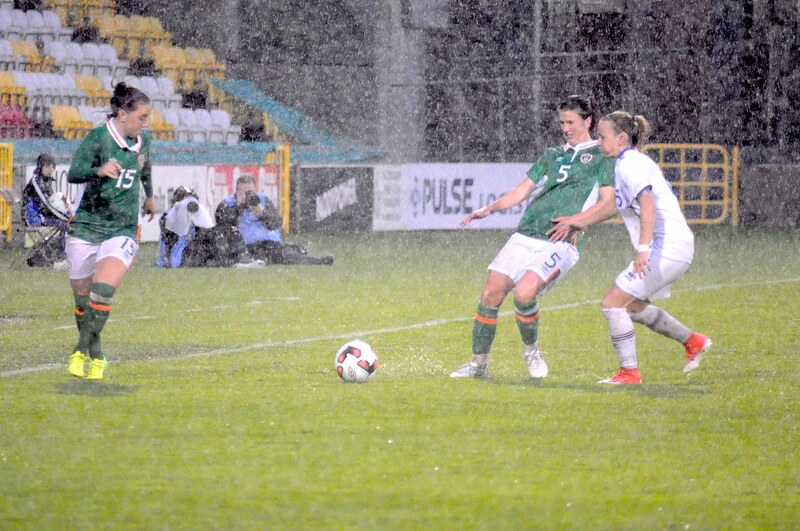 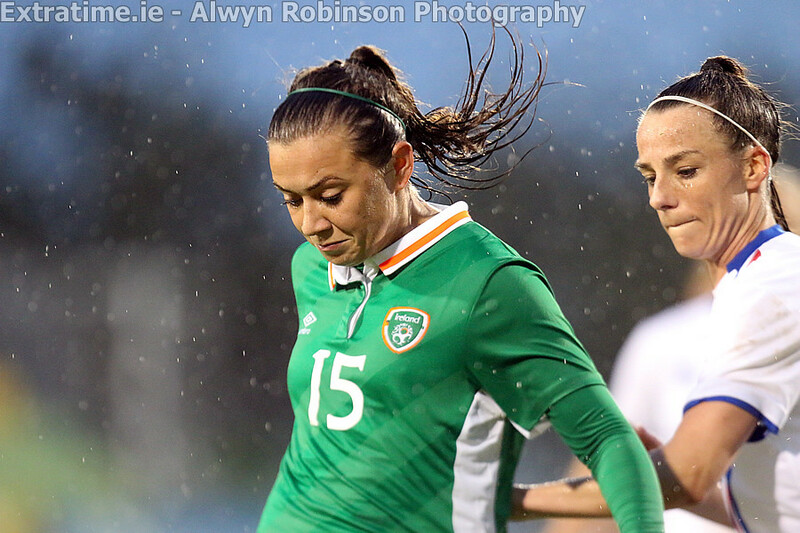 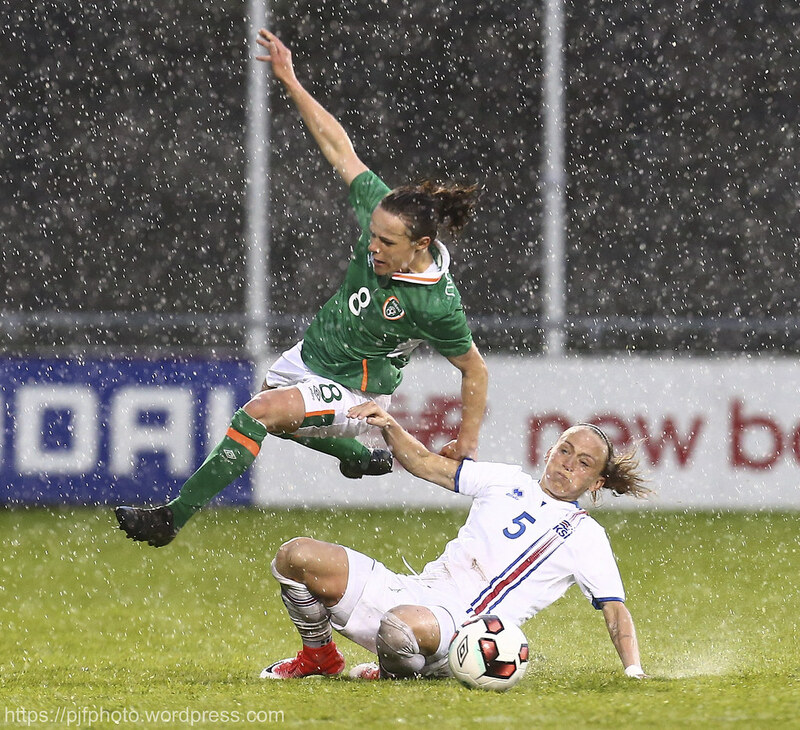 On the whole, this was an encouraging performance from the Republic of Ireland in what were difficult conditions. 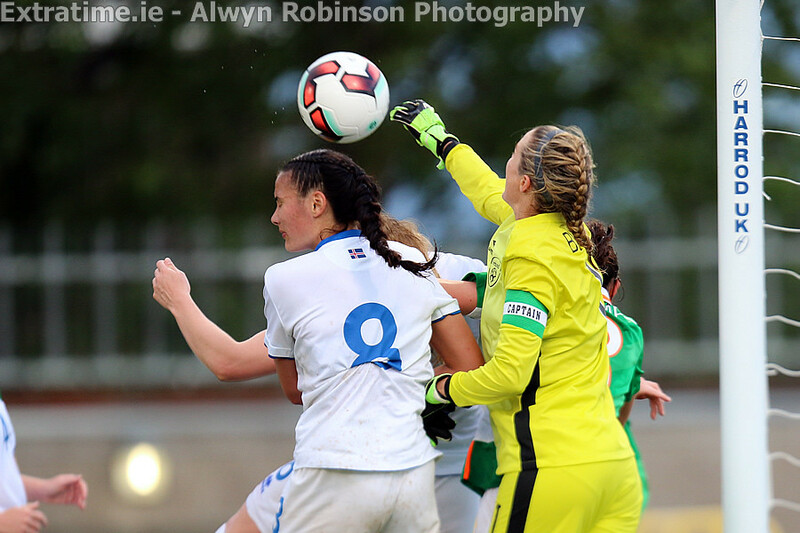 Next up for Bell’s side is a game with Scotland, another side who will be at the European Championships next month. 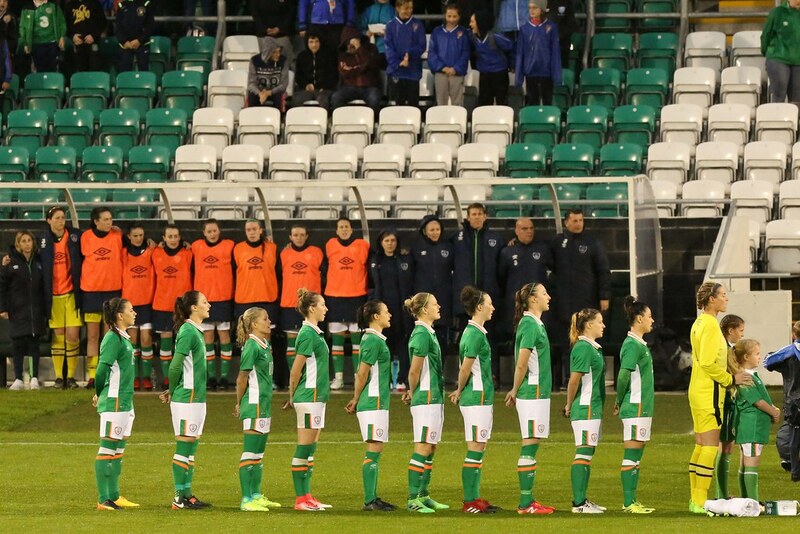 Then for the Girls in Green the real business gets underway, when they will begin their quest for 2019 World Cup Qualification. 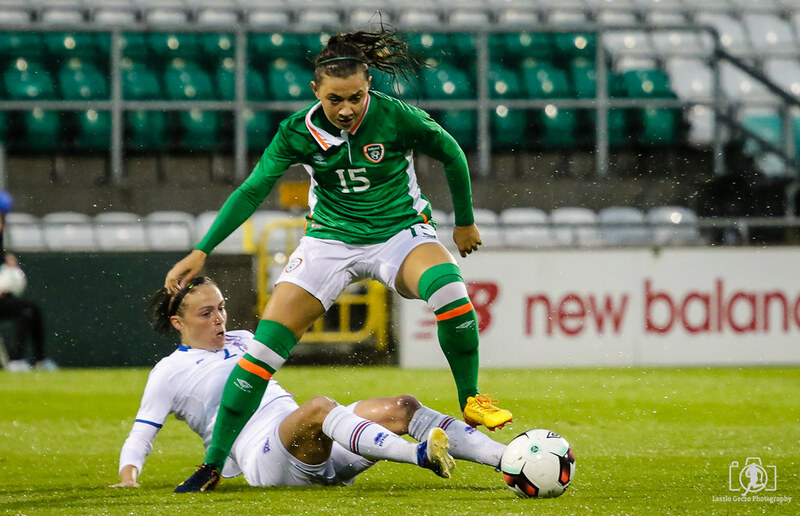 Bell has stated that it is his goal for the girls to qualify for the World Cup. 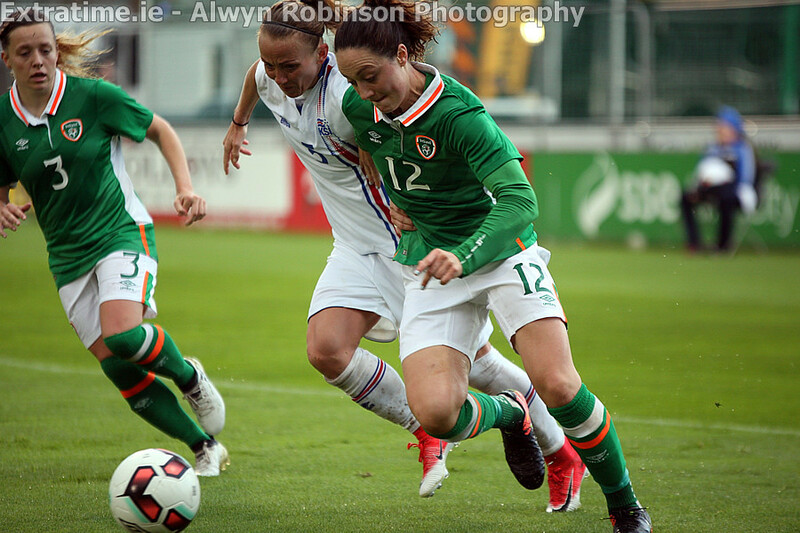 Based on this showing against Iceland and the performances to date under Bell’s reign, Ireland have no reason be fearful and they will have a right crack at contention for qualification. 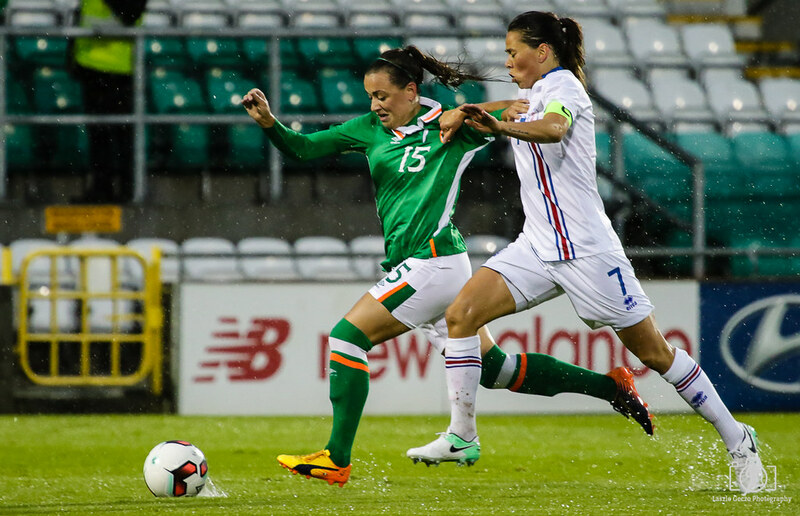 Their first game in the World Cup Qualifying group will be a game against near neighbours in the form of Northern Ireland. 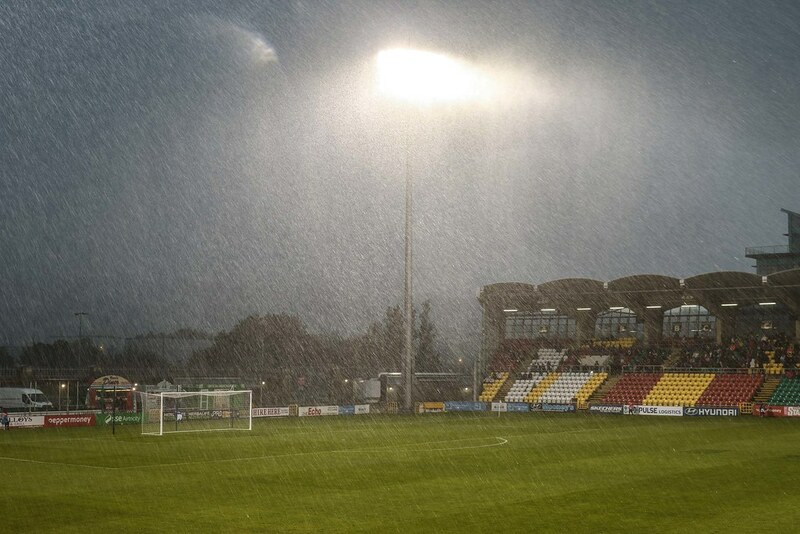 That game takes place on September the 19th. 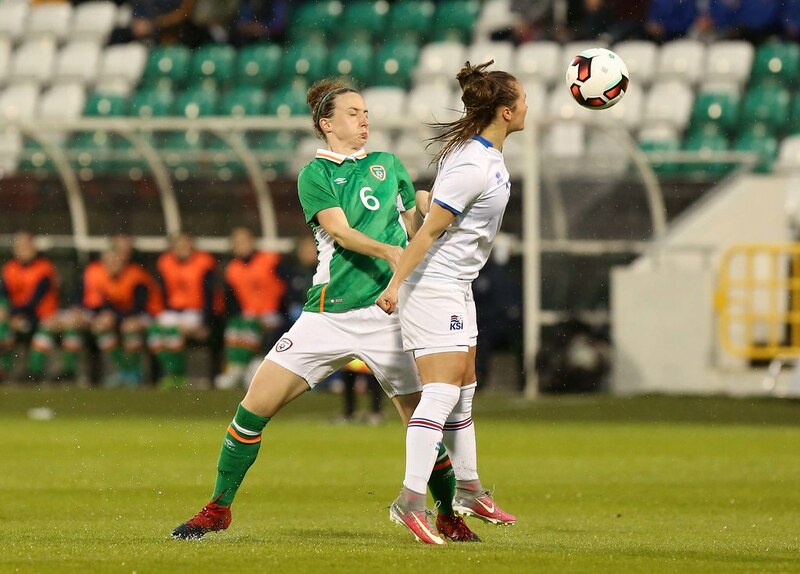 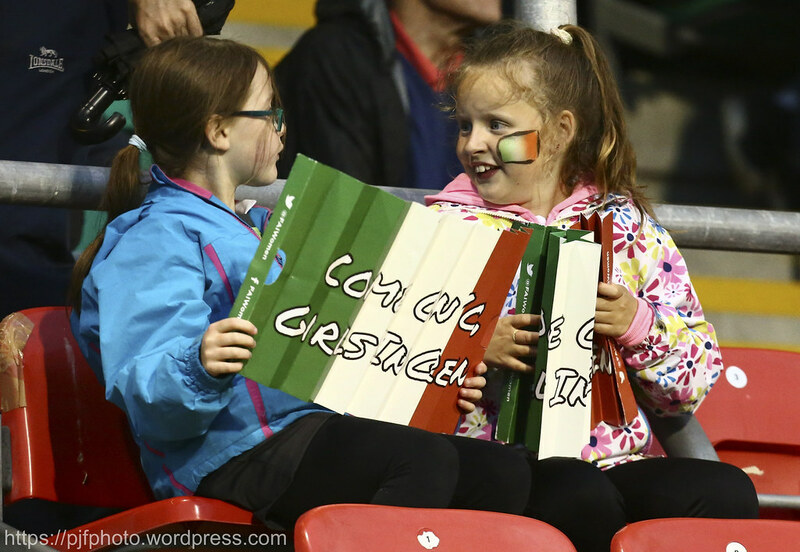 Republic of Ireland: Emma Byrne (Marie Hourihan, HT); Harriet Scott, Diane Caldwell, Louise Quinn, Sophie Perry; Denise O’Sullivan, Karen Duggan; Katie McCabe, Megan Connolly (Niamh Fahey, 72), Megan Campbell (Claire O’Riordan, 80); Aine O’Gorman. 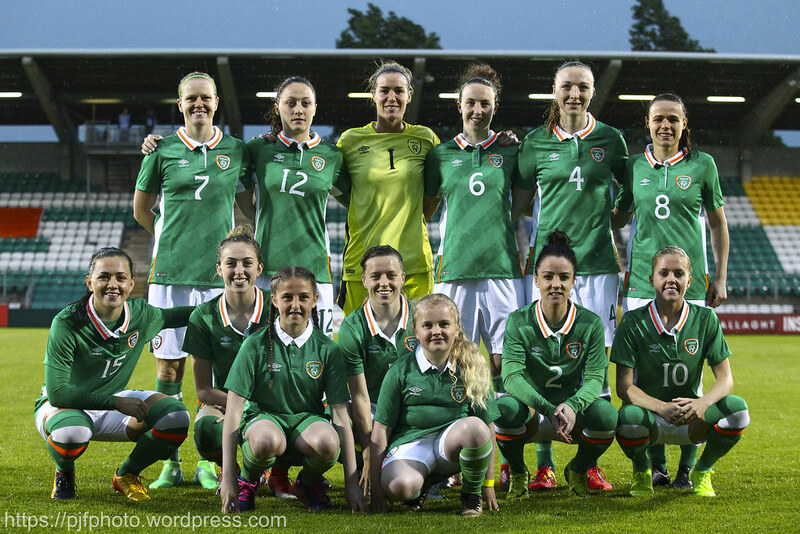 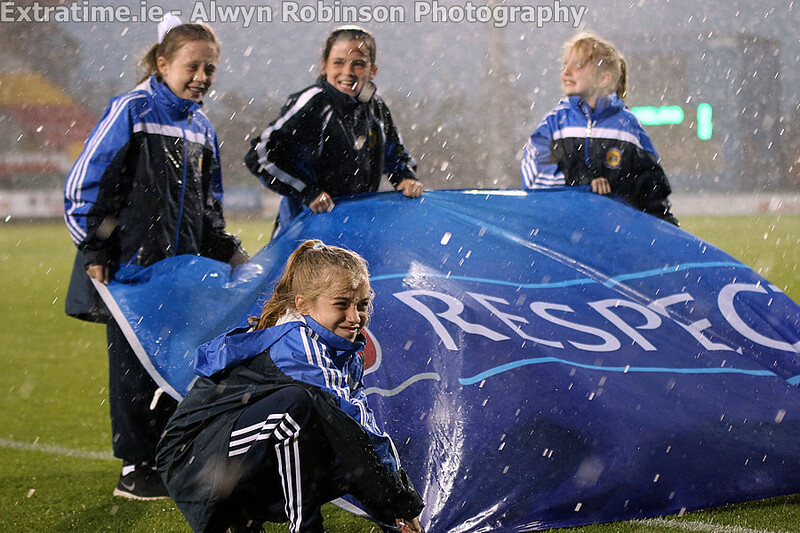 Subs not used: Amanda Budden (gk) Roma McLaughlin, Dearbhaile Beirne, Alex Kavanagh, Heather Payne. 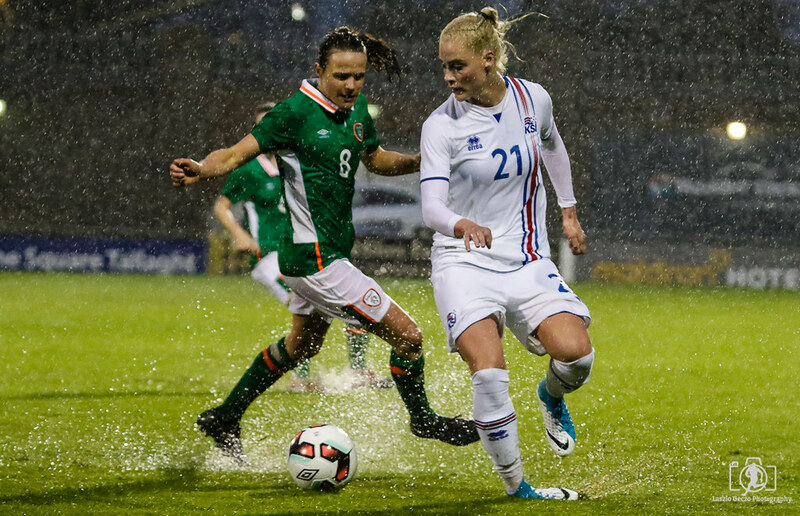 Iceland: Guobjorg Gunnarsdóttir (Sandra Siguardardottir, HT); Sif Atladóttir (Malfridur Erna Siguardardottir, HT), Katrin Asbjornsdottir, Gunnhildur Yrsa Jónsdóttir, Glódis Perla Viggósdóttir; Sara Bjork Gunnarsdottir, Hellbera Gudny Gisladottir, Sigridur Lara Gardarsdottir (Rakel Honnudottir, 65), Sigridur Lara Gardarsdottir, Ingibjorg Sigurdardottir; Fanndis Fridriksdottir (Svava Ros Gudmundsdottir, 67). 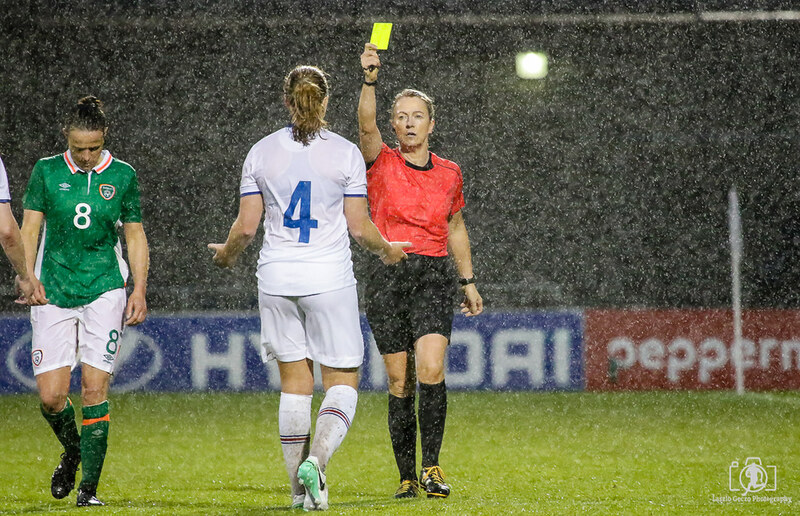 Subs not used: Sonny Lara Thrainsdottor (gk), Lara Kristin Pedersen, Margret Lara Vidarsdottir, Dagny Byrnjarsdottir, Andrea Rán Snaefeld Hauksdottir, Anna Bjork Kristjansdottir, Berglind Bjorg Thorvaldsdottir. 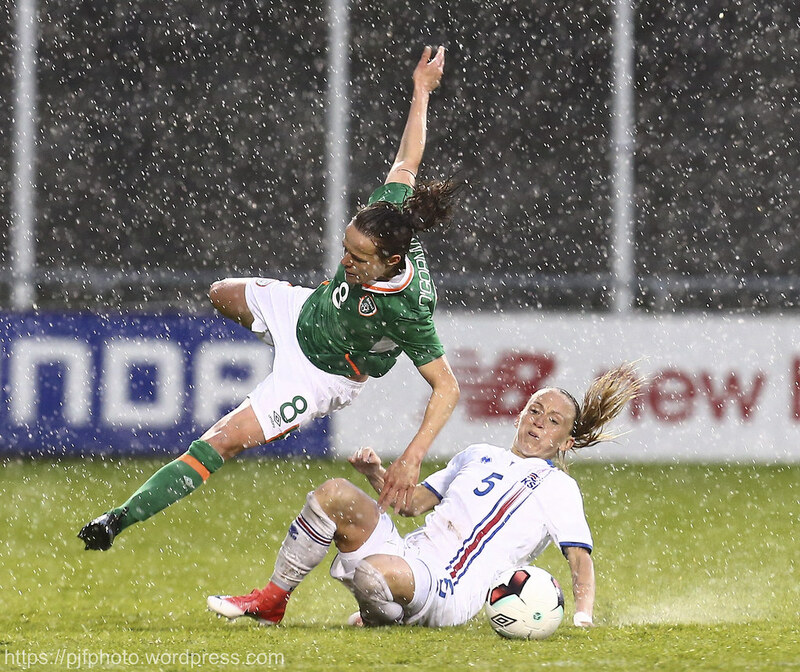 Booked: Sigridur Lara Gardarsdottir (38).